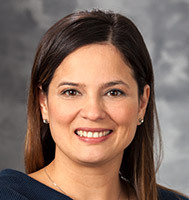 Dr. Leal earned her medical degree from the Federal University of Ceara, Brazil, and completed her residency at University of Chicago Hospitals. She completed her fellowship at University of Wisconsin Hospital and Clinics and the University of Illinois. Dr. Leal is board certified in internal medicine, geriatrics, medical oncology and palliative care medicine.